If you plan to sail from the Port of New Orleans for your next cruise, then there is a good chance you’ll be spending some time in town before your trip. Not only is it a good idea to arrive to your port city at least a day early in case there are any delays in your travel, but New Orleans is a world-class city to visit for fun. From food to entertainment to culture to history, the city offers something for everyone. It would be a mistake to take a cruise from New Orleans and miss out. That said, if you are flying in for your cruise, then there is the headache of trying to figure out transportation while you are in the city. Yes, you can rent a car to get around, but what do you do with it while you are on the ship? And you can also take taxis or Uber/Lyft your way around the city, but that can quickly get expensive. That’s why some hotels in New Orleans offer shuttle service for their guests to the cruise port and/or airport. This can drastically cut down on the expense of getting to the port, so hotels in the area offer transportation to entice cruise passengers to stay the night. If you stay at one of these hotels and use a shuttle, you can save some decent cash on transportation costs. To help you out, we’ve searched out a number of New Orleans hotels with cruise shuttles. With so many hotels in the New Orleans area, this shouldn’t be thought of an exhaustive list, but a starting point for your search. If there is another hotel you’re interested in staying, simply call and ask if they offer a shuttle service. 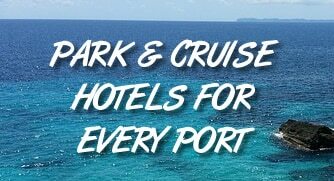 More Hotel Ideas: You can also click here to see hotels near the New Orleans cruise port or see “Park and Cruise” hotels in the port area. Prices are based on a recent search for a Saturday night stay. They will vary based on your specific dates. Click on each hotel name to read reviews on TripAdvisor. In addition to the handful of hotels we found offering shuttles to the Port of New Orleans, there are many that offer shuttle transportation between the hotel and the airport. In some cases, this might actually save your more than a shuttle to the cruise port. Note that not every hotel with a shuttle to the airport is listed below. This should give you an idea of some of your options. Given the location of the cruise terminals in the heart of New Orleans, there are a number of hotels that are within walking distance — meaning you don’t even need a shuttle to get to your ship. Note that prices can and will change depending on what is happening at the Convention Center.